CYB3RCRIM3: The Red Light Camera, the Private Vendor and "Traffic Infraction Enforcement"
The Red Light Camera, the Private Vendor and "Traffic Infraction Enforcement"
After a City of Hollywood (Florida) police officer issued a citation to him for “failing to comply with a red light signal”, Eric Arem moved to dismiss the prosecution and the trial judge granted his motion. City of Hollywood v. Arem, 2014 WL 1612614 (Florida Court of Appeals 2014). operates a red light camera enforcement program using cameras and a traffic enforcement officer. As allowed by law, the City's program produces uniform traffic citations by electronic means. . . .
To assist the City in implementing its red light camera enforcement program, the City entered into a contract with American Traffic Solutions, Inc. (`ATS’), a private vendor, located outside of Florida. Pursuant to that contract, ATS provides the City with, among other things, cameras and a computerized system through which the City's traffic enforcement officer can review the recorded images of potential violations and make individual determinations of whether to enforce such potential violations. Upon personal review of a potential violation, if the traffic enforcement officer makes the decision to enforce a violation, the computer program provided by ATS enables the officer to authorize enforcement by clicking a digital `accept’ button. The ATS computer program then handles the printing and mailing of the notice of violation. If neither of the two options to avoid the issuance of the uniform traffic citation (discussed further below) are pursued, then ATS generates the uniform traffic citation, which bears a computer generated signature for the traffic enforcement officer and the officer's badge number. ATS then sends the original citation by certified mail to the registered owner, and electronically transmits a replica of the citation data to the county court clerk. City of Hollywood v. Arem, supra. The news story you can find here provides a little more information about the issues in the case. On August 17, 2011, at 2:44 p.m., the car registered to Arem was observed by the City's red light camera system failing to comply with a steady red signal in violation of sections 316.0083, 316.074(1) and 316.075(1)(c), Florida Statutes. . . . As a result, an NOV [notice of violation] was issued on September 1, 2011 and mailed to Arem's address. . . . [A]fter Arem declined to pay the penalty or file a statutory defense, a UTC [Uniform Traffic Citation] was issued to Arem. . . . On September 9, 2011, Arem entered his appearance before the trial court and pled not guilty to all charges. . . . Initial Brief of City of Hollywood, City of Hollywood v. Arem, 2012 WL 6962700.
personally `providing by electronic transmission a replica of the traffic citation data to the court having jurisdiction over the alleged offense’. . . , but was merely hitting the `accept’ button to begin the process of generating a[n] (NOV). . . A plain reading of this statute demonstrates the intent of the legislature. It requires that the [officer] provide the required information to the clerk, not a third party vendor. The City's argument that ATS is authorized to make such communication with the Clerk is unpersuasive. Initial Brief of City of Hollywood, supra. county court interpreted these statutes to require the traffic enforcement officer to personally issue the uniform traffic citation and to personally supervise the transmission of the citation data directly to the court. Because the county court believed the City's red light enforcement program had not complied with the statutes, by delegating these tasks to ATS, the City's agent and third-party vendor, the case was dismissed. The county court concluded that the procedures used by the city did not properly confer it jurisdiction over the case. City of Hollywood v. Arem, supra. On appeal, the City claimed the county court's ruling was based on an unreasonably narrow reading of §§ 316.0083(1)(a) and 316.650(3)(c), Florida Statutes. The City also argued that the county court incorrectly concluded that the procedures used did not confer jurisdiction to entertain the violation proceedings. 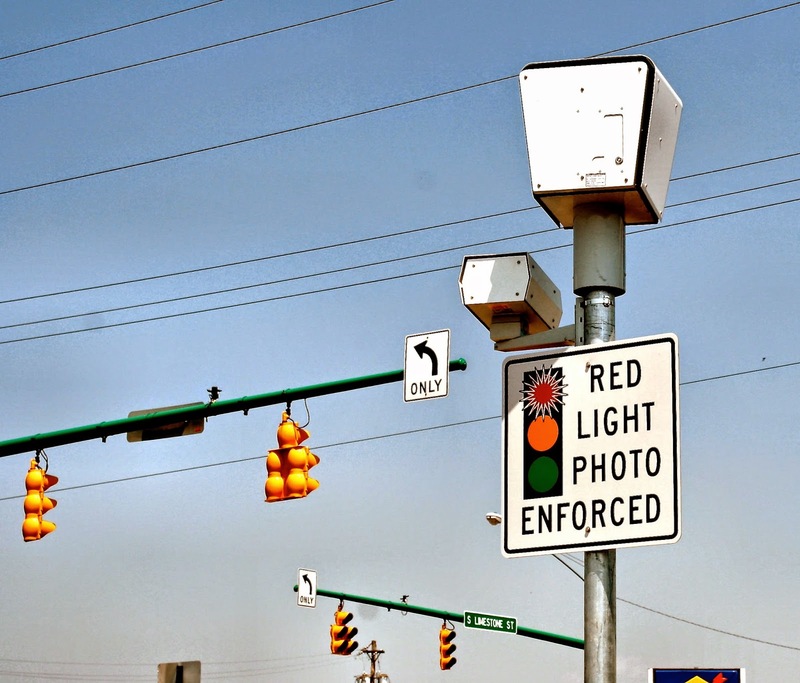 Mark Wandall Traffic Safety Program (`the Act’), authorizes local governments to use red light cameras to enforce violations of [Florida Statutes §§] 316.074(1) and 316.075(1)(c)1; both of which prohibit the running of red lights. . . . The Act specifically authorizes the use of traffic infraction enforcement officers (`traffic enforcement officers) to enforce red light violations. [Florida Statutes] § 316.0083(1). [Florida Statutes] §§ 316.650 and 316.0083 supports the conclusion that the legislature intended to create a streamlined process through which red light traffic infractions may be resolved. That intent is supported by allowing a camera, rather than an officer, to initially capture or observe a potential violator run a red light, and also by the fact that the Act provides that Florida counties and municipalities may establish their case-in-chief by presumption. See § 316.0083(1)(e), Fla. Stat. (creating `a rebuttable presumption that the motor vehicle named in the report . . . was used in violation’ of a red light). The Act further provides for the rebuttable presumption that the registered owner of the vehicle caught running the red light was actually driving that vehicle. See Florida Statutes § 316.0083(1)(b). . . . The county court's interpretation of the relevant statutory provisions appears to defeat the legislature's intent for a streamlined process. Although § 316.650(3)(c) clearly states that `the traffic infraction enforcement officer shall provide by electronic transmission a replica of the traffic citation data to the court having jurisdiction over the alleged offense,’ we do not construe `provide’ to mean that the traffic enforcement officer must be the last person to press the computer keys that transmit the traffic citation data directly to the clerk of court. Florida Statutes § 316.650(3)(c) (emphasis added). We construe the legislature's intent in using the term `provide’ to mean that: (1) the traffic enforcement officer must be involved in the process of transmission as the decision maker; that is, the one who decides whether the citation is to be transmitted to the clerk of court, and (2) the traffic enforcement officer must assure that the appropriate data is sent since a paper document will not be received by the court. City of Hollywood v. Arem, supra (emphasis in the original). statutes to require that the traffic enforcement officer personally transmit the data to the clerk of court, as such would be unreasonable. Rather, he argues that the county court properly interpreted both statutory sections to mean that the City could not outsource `the sole method’ of conferring jurisdiction. . . .
Arem argues that because the traffic enforcement officer does nothing between pressing the `accept’ button after reviewing the visual recording of the violation and appearing in court to give testimony, ATS, an out of state entity, is the one issuing the required notice of violation and uniform traffic citation and transmitting the replica of the citation data to the court. . . . On appeal, Arem also seeks affirmance by presenting arguments based on the underlying premise that the procedures used by the City are an improper delegation of police powers. Arem's arguments come from two directions: (1) ATS, not the traffic enforcement officer, is the one who issues the citation, and (2) the procedures used allow ATS to control who receives a red light violation. only law enforcement officers and traffic enforcement officers have the legal authority to issue citations for traffic infractions, which means only law enforcement officers and traffic enforcement officers are entitled to determine who gets prosecuted for a red light violation. . . . The prosecution requires issuance of a uniform traffic citation as a condition precedent to filing an action to enforce in the county court. By `issuance,’ we mean the officer must: (1) assure the uniform citation form contains basic information regarding who is being charged and the violation charged, including date, time, and place; (2) sign the citation; (3) include his or her badge number; and (4) deliver the original or a copy of the citation to the violator in accordance with the applicable statute. In the context of violations other than red light violations, we are aware of no case law in Florida which holds that the officer issuing the citation must participate in how the original citation is delivered to the court in order to confer jurisdiction upon the county court. We see no reason to hold otherwise in the context of red light violations. proper charging document that confers jurisdiction upon the county court to entertain enforcement proceedings, what is important is (1) whether it was a law enforcement officer or a traffic enforcement officer who made the decision to issue the citation, as evidenced by a signature, and (2) whether the document properly alleges the infraction. Upon reviewing the procedures employed by the City under its contract with ATS, we are satisfied that it is a traffic enforcement officer who makes the decision to issue the citation. The manner in which the original citation reaches the registered owner and the manner in which the digital version of the charging document reaches the county court does not deprive the county court of jurisdiction to entertain the enforcement proceeding. `traffic infraction enforcement officer shall provide by electronic transmission a replica of the traffic citation data to the court having jurisdiction over the alleged offense,’ we do not construe the statute to require any personal involvement by the officer in the transmission other than to assure: (1) the uniform citation form contains basic information regarding who is being charged and the violation charged, including date, time, and place; (2) the citation is signed (by original or electronic signature); and (3) his or her badge number is included. We see nothing in the statutes which would deprive the county court of jurisdiction if a computer program is designed to provide those assurances once the officer makes the decision to issue a citation. again focuses on the assertion that the traffic enforcement officer did not issue the citation because he did nothing in the prosecution of the case between pressing the `accept’ button and appearing at the trial. However, our interpretation of the statutes negates the argument that the officer did not issue the citation. City of Hollywood v. Arem, supra (capitalization in the original). makes it clear that the traffic enforcement officer exclusively decides whether to initiate a prosecution by issuing a notice of violation, which leads to the issuance of a citation if no response is received. There is no delegation of authority for ATS to make the decision to issue a citation. Finally, Arem argued that “because ATS does the initial screening of the images which are sent to the traffic enforcement officer, the City has in essence given an unauthorized entity prosecutorial discretion, an improper delegation of police power.” City of Hollywood v. Arem, supra. The Court of Appeals rejected this argument in part because it reviewed the contract between ATS and the City and found it contained a paragraph that authorized ATS to (i) make the initial determination that “the image meets the requirements of the ordinance and this agreement, and is otherwise sufficient to enable the City to meet its burden of Demonstration a violation of the Ordinance” and (ii) to decline the process an image if ATS “determines that the standards are not met”. City of Hollywood v. Arem, supra (emphasis in the original). requires ATS to send the images and information regarding the violation to the traffic enforcement officer if certain standards are met. The contract does not give discretion to ATS to withhold sending information if the standards are met. The procedures under the contract are analogous to the discretion law enforcement officers have as to whether there is enough evidence to send a potential criminal law violation to the state attorney's office for prosecution. Having found that the judge “erred in dismissing the prosecution,” the court “reverse[d] and remand[ed] for the county court to vacate the order of dismissal and reinstate the proceedings” against Arem. City of Hollywood v. Arem, supra. If you would like to read a law review article that takes the opposite view with regard to red light cameras, check out the one you can find here.